We cannot live in community if lies carry the same weight as truth, if bad words are allowed to destroy good ones. We cannot get used to the President’s lies. We cannot accept alternative facts. We cannot stop insisting on honesty. Lots of people who have the Ten Commandments hanging on their wall are tempted to ignore the ninth one, but we have to keep paying attention. Presidents have been dishonest for a long time, but it has always been our job to hold them accountable. Our work is harder now, because no president of either party has had so little regard for reality. Presidents need to get in trouble when they lie. Trump lies about the tremendous size of his electoral victory, the amazing number of people at his inauguration, and the huge number of times he has been on the cover of Time. He lies about health care, voter fraud, wiretapping, his tax returns, trade deficits, vetting for immigrants, terror attacks in Sweden, and a non-existent apology from The New York Times. He lies about things that are easily checked—like a non-existent phone call from Mexico’s president calling to praise Trump’s immigration policy. If Donald Trump had been our first president, he would claim the cherry tree is still standing while holding an ax and eating cherries. Kellyanne Conway would roll her eyes and back him up. We cannot say, “That’s Trump being Trump.” We cannot believe that truth does not matter, because truth is bigger than the presidency. Conventional wisdom is that the lies are hurting Trump and his policies, but the truth is that lies set everyone’s pants on fire. Trump may have been elected president not in spite of his lies, but because of them. His presidency may be the result of our lack of integrity. We have to understand that justice depends on people telling the truth. Lies are matches that destroy forests that have been growing for decades. Lies turn harmony into hatred. Lies makes us forget how good honesty is. Mahatma Gandhi said, “There is no God higher than truth.” Lying hurts everyone by distancing us from the higher truth. When our leaders love partisan politics more than truth, the whole country loses its way. We need to be indignant when the President lies. We cannot let untruths pass unchallenged without damage to our souls. We need to defend truth, because truth is our best defense. The words we hear affect our hearts—even when we wish they did not. We are what we hear. We need leaders who know how to bless us with what they say. We need words that heal. We need words that make us better. We need to make America honest again. Years ago when attendance had gotten small, Plymouth Church brought in a consultant who said, “You can either be a museum or a church.” The consultant had been going to the wrong museums. A good church is like a good children’s museum—a place to learn, explore, and discover. On Monday night I met with eighteen members of our church’s history ministry. They know how good a museum can be. Plymouth’s tour guides are better than the ones who wander down Orange Street. We share an amazing history, so touch Plymouth Rock and give thanks. Sit in pew 89 and wonder what Abraham Lincoln prayed when he sat there. Turn off the lights in the basement and imagine what it feels like to run for your life. Visit the Senior Minister’s office and think of Branch Rickey praying there until he decided that God wanted him to ask Jackie Robinson to integrate baseball. The list of people who have been in our building is surprising—Ralph Waldo Emerson, Frederick Douglass, Susan B. Anthony, Harriet Beecher Stowe, Hillary Clinton, Sonia Sotomayor, Elliott Spitzer, Colin Kaepernick, Norah Jones, and Sarah Jessica Parker. A couple of years ago our Senior Minister Search Committee was asked to fill out a form that asked for the three biggest moments in the church’s history. They picked Henry Ward Beecher’s tenure as the first pastor, Martin Luther King, Jr. preaching an early version of his “I Have a Dream” sermon at Plymouth, and the church recommitting itself to Jesus Christ in 2004. Plymouth’s resurgence is part of the story. We do not have to choose between being a museum and a church. We think about what God has done to remind us that God is still at work. Love may be blind, but we are together for better or worse, so I want you to know what my goals are, recognizing that I have only been on the job for three weeks. I plan to get more rational. I want to ride the subway without repeatedly looking at the map to make sure the train is still headed in the right direction. I want to go a day without consulting my gps. I want to honk my horn like a New Yorker. I want to go to a Mets-Braves game without secretly rooting for Atlanta. I want to convince myself that climbing stairs counts like a trip to the gym. I want to feel at home at Plymouth. I want to know names—including the 22 Davids listed in the church directory. I want to learn our history as a way of visioning the future. I thank God for Henry Ward Beecher, Sojourner Truth, Martin Luther King, Jr., David Fisher, and Al Bunis. I want to be grateful for where we have been as well as where we are going. I want to learn how we tell our story. Plymouth is a gift to our community. You and I have friends and neighbors who need this church. We need to let them know we are here for them. I want to understand how we learn the Christian story together. The best Christian education is not just learning content, but becoming more like Christ. How do we do that at Plymouth? I want to help people find friends. I want to know which groups will be the best family for which newcomers. I want to know about the ways we care for the hurting. Our ministries help us become the people God wants us to be. I want to continue to feel God’s presence when I walk into the sanctuary. I want to have a part in our worship growing deeper. I love our worship, and have no desire to change things for change’s sake. The goal is to strengthen our worship so that we can more fully give ourselves to God. I want to be a good person as well as a good senior minister. I want to set up patterns for well-being and growth: prayer, exercise, and study. I want to give guidance, support, and care to the leadership and staff of Plymouth. I want to understand the structure of the church’s ministry, to ascertain what organizational needs we have. Carol and I came to Plymouth to be part of the family. I want to hear your stories, and I want to share my story. I want to move past being acquaintances and become friends. I want to be real church. What makes us unique? What do we share? These were the two questions Jane Huber set before 45 women on Saturday, January 30th during the Annual Women’s Retreat. This year, the theme was “On Common Ground.” Had super storm Jonas not come through, it would have been the weekend after the Church’s Anti-Human Trafficking event however, instead it almost divinely preceded the current challenge to our congregation. Throughout the weekend, I found myself wondering: did I learn more about how to find Common Ground? If so, what did I learn? If not, does that mean I didn’t get the benefit of Jane’s amazingly well thought-out program? In the first part of the morning, Jane had us look at a passage from Acts 17:22-31 in which Paul is able to get the attention of the Athenians and explain the concept of his God versus theirs. She asked us to look at where we saw Paul establishing common ground and who, or what, is Paul’s God. The passage ends with him using the words of the Athenians’ own poets to explain his concept of his (and our) God saying, “For ‘In him we live and move and have our being…For we too are his offspring.’” In other words, God is in each of us, not in a shrine. Taken together, this is a powerful new notion of God that I now have as a result of this retreat. I have already been learning that if God is in each of us, then knowing my uniqueness is a way of knowing God. But what I got from Jane on Saturday was that if knowing my uniqueness allows me to know what you and I share, then it is a compassionate way of learning how to love you and want for you, as I love and want for myself. And if I can get myself there, then I have expanded my visceral knowing of God. I imagine this is what it feels like as a parent, that your identity increases in each child. As your identify increases, so too does your connection. As I find more common ground with others, can my connection to God increase? 1. (especially prior to the Civil War) a person who advocated or supported the abolition of slavery in the U.S.
I’m a member of Plymouth Church in Brooklyn Heights. After “church shopping” I joined Plymouth because of its stand on social justice issues. Plymouth is proud of its history. Founded in 1854, the congregation called as its first minister Henry Ward Beecher. They gave the famed abolitionist, brother of Harriet Beecher Stowe, a platform – literally – to speak on. In those turbulent years leading up to the Civil War and through the Emancipation Proclamation Plymouth would be packed on Sundays with close to 3,000 people, come to hear Beecher preach against slavery. Famous anti-slavery advocates spoke at Plymouth, including William Lloyd Garrison, Sojourner Truth, and Frederick Douglass. Plymouth held deep philosophical connections with the Underground Railroad — the secretive network of people who helped slaves escape to the North and Canada. Documentary evidence lends support to the belief that Plymouth was also a site of active participation, known as Brooklyn’s “Grand Central Depot.” Plymouth brought Abraham Lincoln to New York for his famous speech at Cooper Union, that launched Lincoln’s presidential campaign. Here, in Brooklyn Heights, is a place where people gathered who changed history, affecting the lives of millions. But what benefit is this history? Fours years ago Plymouth hosted a discussion on human trafficking. I went, hardly knowing what the term meant. Two years ago we revisited the topic. In partnership with the Brooklyn Historical Society we sponsored a round-table discussion moderated by now attorney general, Loretta Lynch. The more I educated myself on human trafficking – on modern day slavery – the more I unearthed facts, metrics, and numbers: There are more slaves in the world today than at the time of the Civil War. Slavery does not happen only overseas, but in the United States. Not just the United States, but all fifty states. In New York. In New York City. In Brooklyn. In my backyard. So how accurate is the definition of abolitionist (above)? Is being an abolitionist, working to abolish slavery, a thing of the past? No. Too much work needs to be done. The New York State Anti-Trafficking Coalition launched a campaign in 2013, New York’s New Abolitionists, to raise awareness around human trafficking and modern-day slavery. It’s a brilliant campaign, drawing lines of connection from abolitionists past to abolitionists working hard to end slavery today: doctors, lawyers, survivors, people from every walk of life. 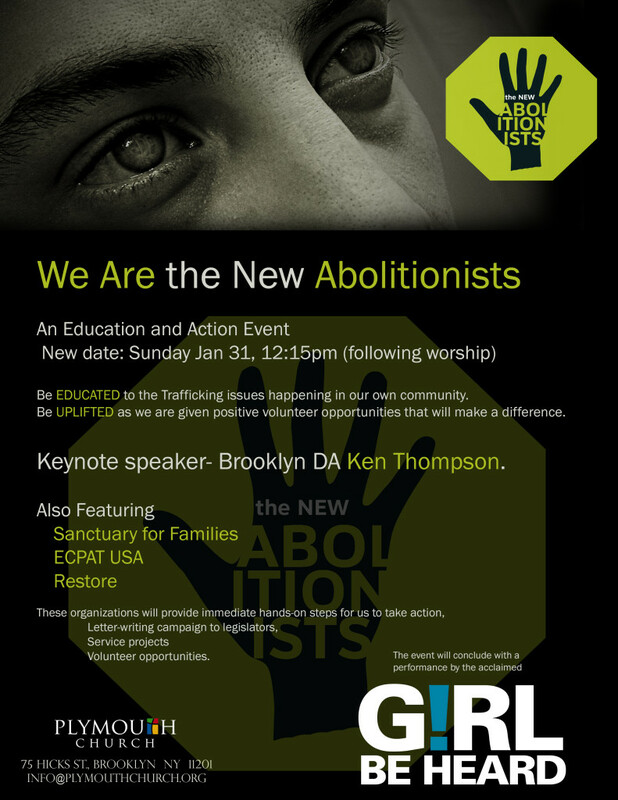 What I’ve learned is that we can all be new abolitionists. Let us not be condemned to repeat history, but to effect change, today. I invite you to come to Plymouth this Sunday: listen to Brooklyn DA Ken Thompson, meet and speak with folks from Restore, ECPAT-USA (End Child Prostitution and Trafficking) and Sanctuary for Families. See and hear the testimony of trafficking survivors given by the activist teen theater group Girl Be Heard. If you already know the story of human trafficking in New York City, come to learn what you can do to to end trafficking. And if you already volunteer, come to meet us, other like-minded folks. Join the crowd. Be an abolitionist. A new abolitionist. Because We Are the New Abolitionists. No one else. Us. Posted in: Christian Life, Community, History, Missions, Plymouth Church, UncategorizedLeave a comment on What Good is History?